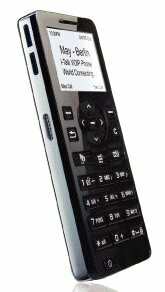 The i-Talk Nano, A Simple VoIP Phone | OhGizmo! With Skype getting so hot, VoIP handsets are popping up all over the market. Some are fancier than others, in terms of features; the i-Talk Nano falls rather close to the pretty-barebones team. Its distinguishing feature, as you may have guessed from the picture and name, is its resemblance to Apple’s player. However, we gotta give it props for working with most major VoIP services, like Skype, MSN, X-pro, X-lite, Net2phone, eyeBeam, Firefly, SJphone, StanaPhone, Noodle softphone and AIM Phone. It connects via USB 2.0 (no wireless?) and will work right out the box on XP or Mac.